I can't recommend Bali enough as a honeymoon destination. The hospitality across the entire island is unmatched by any place I have ever been. The culture is beautiful, the people are friendly, and there is a ton to do and see. More importantly, the food scene is impressive. My husband and I traveled to Bali from Arizona with a layover in Los Angeles and Hong Kong (~36 hours). 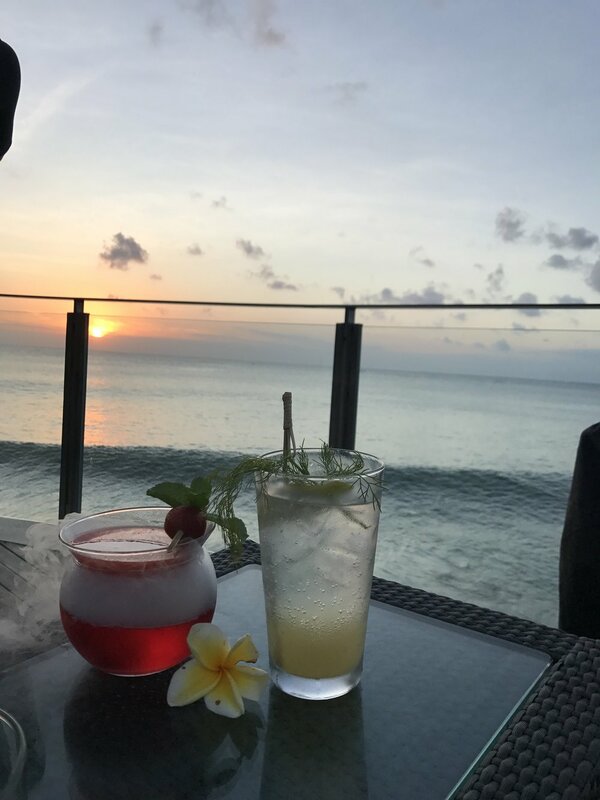 We decided to spend our first few days relaxing at the beautiful Ayana Resort in Jimbaran. It was hard to choose from so many beautiful places along the coast of Bali but we picked this one because we were dying to experience their iconic pools overlooking the Indian Ocean. It was such an amazing experience that we didn't leave the resort for 3 days (don't judge!). Ayana has a lot of restaurants on the property (and the property is huge), a handful of pools, a beach club, and an amazing spa. Upon arrival, we were greeted with a welcome drink and (real) flower leis. We found out that we had been upgraded to a villa with ocean cliff views as a thank you for traveling so far. When we got to the villa there was a bottle of champagne, a strawberry chocolate dessert, and a flower petal bath waiting. We quickly forgot about our jet lag. The next morning, we enjoyed a floating champagne breakfast, which was more than enough food for two people but it made for a really memorable breakfast. Not a bad way to start the rest of your life with someone, right? We tried the Aquatonic Pool, which was a great way to recover from the long flight. The rest of the trip we ate at Dava for breakfast, and ended up eating dinner and having a few night caps here as the staff quickly become our friends. We also had happy hour at Rock Bar with the waves of the Indian Ocean crashing beneath us. While there are ~500 seats at Rock Bar, their Villa guests get priority, which made booking at The Villas at Ayana even more worthwhile. I think our favorite part of our stay at Ayana was the ocean pool, which is an infinity edge pool overlooking the Indian Ocean, which has only a handful of day beds and chairs that creates a really serene atmosphere. The pool attendant, Sekar, made everyone's pool experience extraordinary by taking amazing photos for guests. Guests would say, "Sekar, you should be a photographer!" and she would respond, "I am, I'm your photographer!" On day 4, we left around noon for Ubud via a car arranged by the hotel. It took about 2.5 hours to get to Ubud with traffic (there is a lot of traffic in Bali), but we stopped at a coffee plantation on the way to Ubud to learn about and try Kopi Luwak coffee. The staff at Ayana kept telling us Ubud was magical, and it truly was. We stayed at COMO Uma Ubud because of the experiences you can schedule and book through the hotel. Como Uma is very tranquil and intimate. It rained for the majority of our stay here but their bar scene is so tranquil that we really did not mind hanging out here with a good book, each other’s company, and a cocktail. Through the hotel we booked a sunrise hike up Mt. Batur, a private tour to a local village, temple, and rice field. We also took some beautiful walks from our hotel through Ubud -- only using a taxi at night time. They have a lot more to offer than what is on their website and they can customize experiences, which is what we did. COMO Uma has some amazing food and their dining locations are all open air. Breakfast was included where you overlooked a pond. Then there was the Italian restaurant and the Uma Bar which was our go-to spot to relax with a drink and book while it rained (and it rained for 2 days straight). They also have a gym and yoga classes with a pretty incredible view. We went to the Ritz one night for dinner because you dine along the Ayung river in a bamboo woven Kubu. While the Kubu and property in general is beautiful, the food was not worth the price tag. The best meal we had in Ubud was at Mozaic which was recommended as a must-go foodie spot by Como Uma staff. The entire dinner incorporated food grown and local to Ubud. It was a great experience and a great toast to our last night in Ubud. One of the highlights of the trip was visiting I Wayan Gama Painting School where we purchased a beautiful Saraswati drawing. It was fascinating to learn about how these painting come to be. The students spend months working on these intricate drawings. We also got to see wood carvings at Dewa Malen in Gianyar. This is just a glimpse of the art you find throughout Bali. 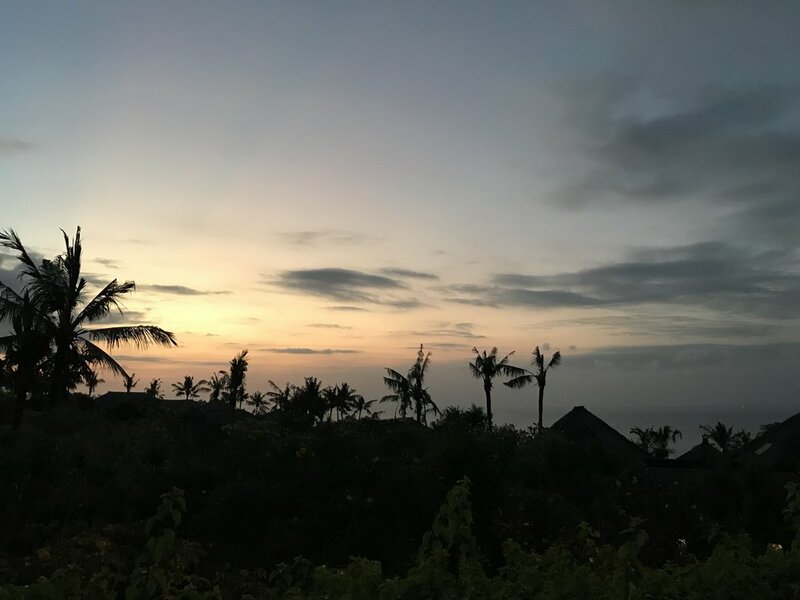 We went into Ubud without any reservations, but we learned quickly that things book quickly so it is best to book in advance any activity or restaurant that you want to try. In hindsight, we wouldn't have done the sunrise hike -- we had to get up at 1:30am to drive to the mountain, it was freezing, and we had to hike for several hours in the dark on rocky terrain. We ended up not seeing the sunrise due to fog and got stuck in terrible traffic on the way back (but we did see monkeys). By the time we got back to the hotel around 2pm/3pm we were wiped out. If you do go, make sure you bring the proper attire and understand what you're signing up for (we didn't). UPDATE: We have talked to various friends since this trip about the Mt. Batur hike and you can get a private tour, which I would recommend. While the rice fields were amazing, they had just harvested the rice when we got there so the rice fields weren't as green and lush as we had anticipated. If you are wanting to see the rice fields at their best make sure you go before the rice is harvested. More importantly, leave room to explore and walk around. For our last day, we headed back towards the coast so we could be close to the airport. We left Ubud around 3pm and did not get to Seminyak until about 6pm. Seminyak is like any other touristy city. We didn't get to explore very much because we got in so late and had to leave first thing in the morning. There was A LOT going on and everything looked fun. We stayed at TS Suites and ate at Ku De Ta. Both were nice, but the food at Ku De Ta did not live up to the hype.